I have always loved the 1950’s. Maybe it is because I was born in 1957, maybe because of the TV shows & movies I’ve seen. 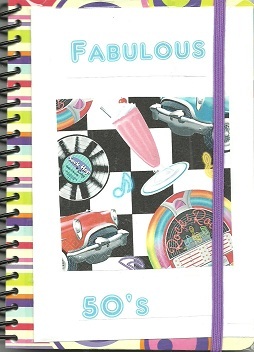 I love the music – Doo Wop, early rock & roll, the dances, the fashions! Life was so simple then. What do you like about the ’50’s? Use as many pages as you want. Do not alter anyone else’s contributions. Relist within two weeks. Only relist within BookMooch. When full, return to DRWS. This is a game journal. I don’t know a name for this game which we have played in my family and my husband’s family for as long as we can remember. You start with a word and changing one letter at a time to form a new word try to change every letter one step at a time, to form a new word. So the aim is to change a 3 letter word into a different 3 letter word with no letter in the same position in each of the words. This should make 4 separate words. It becomes harder when played with 4 letter words, when you aim to end up with 5 words. I found it impossible to keep the nice ironies or similarities between first and last word, going, when I tried to make 5 letter words change in just 6 steps. So I gave the journal the name 3,4,5. 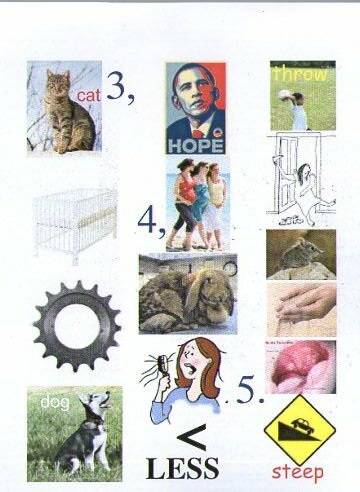 As a slight aid I have added pictures which may sometimes help with the next word. The answers are on the back page, but try to do them without referring to the answers! I have done 3 on the front cover and three more 3, three 4 and three 5 letter words. Add your own on the following pages and work backwards from the end with your answers, If the journal needs repairs or it starts to run short of pages I can add more iand will mooch it back if contacted through Bookmooch. Please relist this journal when you receive it and delay sending no more than two weeks after a request. If it is not mooched contact bmjl and your local shelf-holder will mooch it for the library. A lot of effort and thought goes into creating journals, please enjoy them and allow others to do so. List using the number given opposite, only on Bookmooch.